Chad Lawrence doesn't disappoint with this corker of a tale. 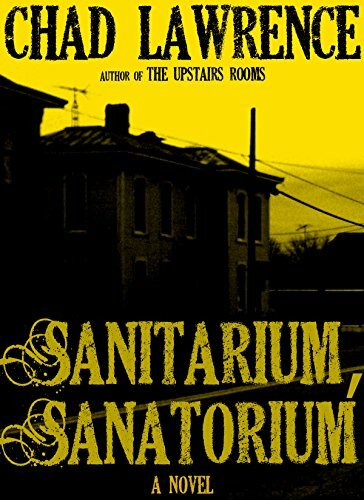 Sanitarium, Sanatorium is told from the viewpoint of 15 year old Eddie who finds his life unexpectedly disrupted when his family up sticks and relocates to Ohio. He feels increasingly lonely and isolated until he meets the mysterious Sandy who lives with her authoritarian father in a house surrounded by a junkyard on Eddie's new street. 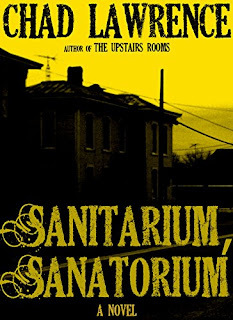 Sandy takes Eddie to an abandoned hospital in the woods close to where they live; a place Sandy claims to love. Meanwhile, Eddie's home life starts to fall apart. His once alcoholic father begins drinking heavily again and hanging out with the creepy Lieutenant Grigsby. What hold does Grigsby have on his father and what is Sandy's real role in the ensuing craziness? I really like Chad Lawrence's writing style. He certainly knows how to tell a cracking tale. This book is set in the '80s, which is the era I myself was a teenager. It was a time before mobile phones were permanently glued to ears and a time when kids thought nothing of exploring for the day on their bikes. Lawrence captures the era perfectly and I felt totally transported back to that time. All-in-all a very good read. After his family’s move to a dying small town in the hills of southern Ohio, fifteen-year-old Eddie has been wasting his summer wondering how he’ll make any friends while living on a dead-end street, which his family shares with only one other mysterious house—one standing at the center of a what appears to be a junkyard. But when the girl named Sandy who lives in that house introduces herself to him and proceeds to sneak him into it through her bedroom window for a day spent listening to records, he thinks his loneliness might be over, even if his mother doesn’t like the girl, and even if Sandy wants to take him back into the nearby woods to show him something hidden there, something she claims to love. It’s only after they rescue a cat from being tortured by a local boy Sandy calls the “Kitty-killer” the next morning when Eddie begins to discover a series of shocking truths about his new home town and the long abandoned hospital located in the woods nearby that used to give the town its purpose. And as his home life begins to unravel in the wake of these events and discoveries, he also learns painful truths not only about his parents, but about the strange girl he has come to know as his friend—things that make him question his own sanity as he struggles to maintain a sense of normalcy in a world suddenly gone mad.